Death is a great and grand mystery, and the actual act of dying is the last physical act of our lives. We can do it well, like a graceful well-rehearsed piano solo—or we can do it like that first awkward dance with a middle-school crush. But if anything deserves our full attention, some preparation, or some renewed clarity, death might be it. 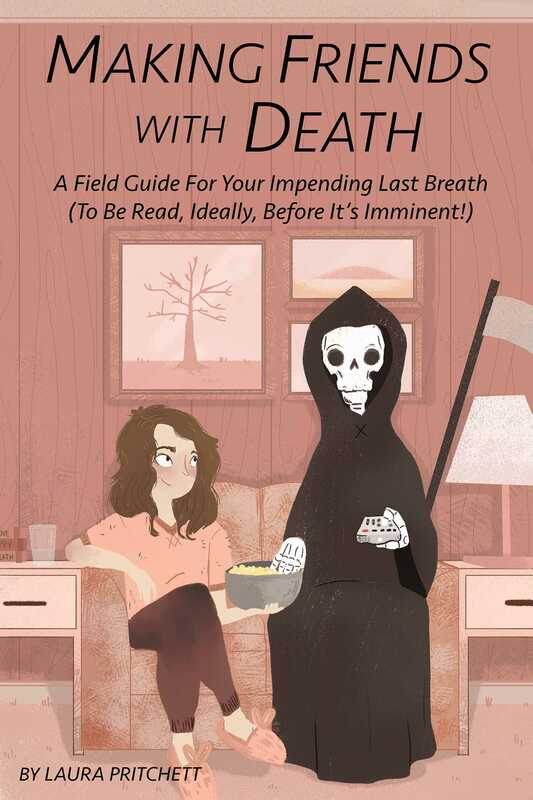 In this light-hearted, irreverent exploration of the one thing that is certain in all lives, Making Friends with Death offers a look at all the uncertainty that precedes this final act. A compelling mix of practical how-to advice and personal narrative, this book encapsulates our greatest quest—to make peace with death. Pritchett offers up wisdom she has gleaned from all sorts of places, including a decade of traditional research and a lifetime of other related, but less formal, pursuits (digging up a dead body, watching her dog be necropsied on the lawn, hosting Death Cafés, and confronting the grim reaper himself). Pritchett’s stories and exercises were very enjoyable to read, often funny, always open and sincere, and written to put the reader at ease. Even without the guided exercises, one might enjoy simply reading her stories. But don’t just read this book! Use the guide, take control of the one thing we can all count on (dying) and plan your death and your life accordingly. Write your own story and you will have made a new friend. "As a practicing clinical psychologist, I exhort all my patients to confront their fears and adversities head-on—rationally, courageously, with grit and determination. This is exactly what Laura Pritchett does in her much-needed self-help book, Making Friends With Death. She shares a veritable cornucopia of personal experiences, strategies, perspectives, and workshop-like exercises to demystify, intelligently prepare for, and gracefully manage this most daunting of all of life’s challenges—our passing. Written in an accessible style fused with warmth, humor, and wisdom, it should be on everyone’s got-to-read list and part of every clinician’s library." "Death, that universal experience that is rarely discussed at parties, is now made accessible to all of us. Laura Pritchett has provided us with an intricate road map for the exploration of our death so that we can get on with the business of joyful living." "While I’ve read my fair share of advice and research on dying, sat with dying patients, and experienced my own mortality at a young age, nothing could’ve prepared me for this book. The emotions surrounding death—from catapulting hope to bottoming out grief—are captured in such a succinct and artful way that is at once both fearfully honest and, dare I say, entertaining. Laura Pritchett has assembled a true workbook for the one course none of us want to take. Astonishingly, I feel I may have been given the key to a good death."